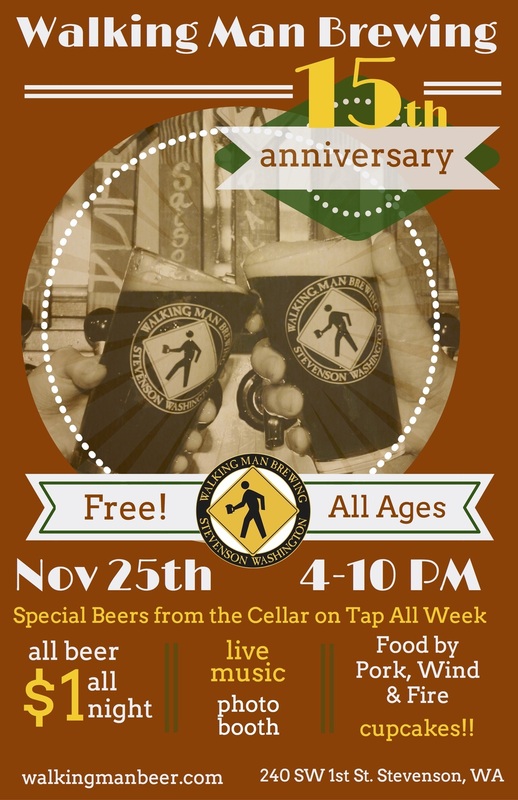 Stevenson, WA (November 2015) - Walking Man Brewing will host their 15-year anniversary party on Wednesday, November 25th from 4-10pm. 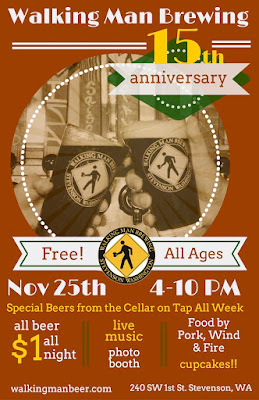 To celebrate, the brewpub will feature $1 drafts and special rotating taps throughout the event. Featured beers include Nitro Bourbon Barrel Jaywalker Imperial Stout, Big Phat Homo Erectus Dry-Hopped Imperial IPA, Sour Wheat, Flip Flop Pilsner and several year-round favorites. “We’re bringing out some heavy hitters from the cellar and with every beer just one dollar, we hope everyone can add us to their holiday plans and celebrate 15 years of craft beer in Stevenson,” said managing partner Tabatha Wiggins. 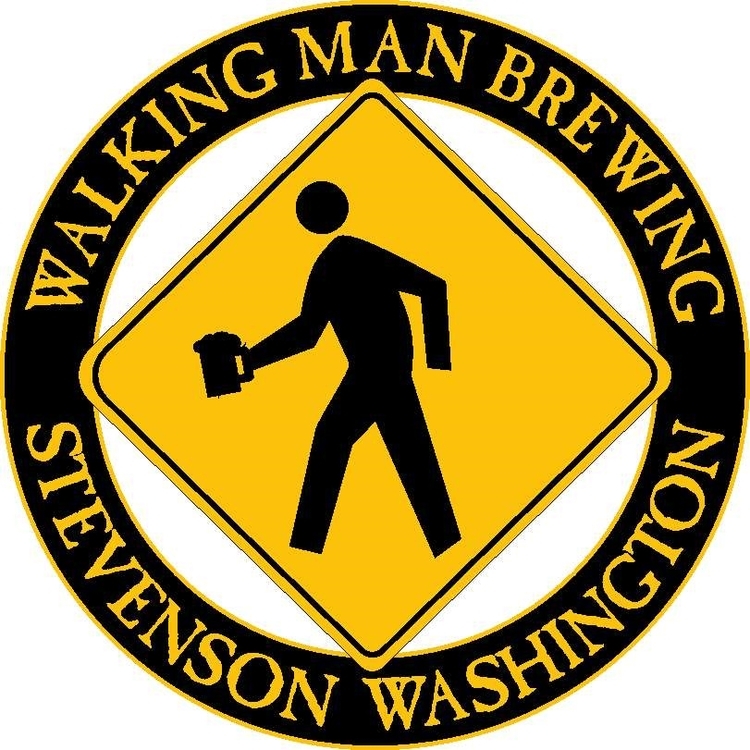 Established in 1999 Walking Man brewed what would become known as Pale Strider Pale Ale on Thanksgiving Day of 2000. The 20-barrel brew house was designed with a single infusion mash tun, steam fired kettle and open fermenters. The process requires every batch be stirred by hand, requiring dedication and love of the craft. Holding true to their roots, Walking Man remains a small production brewery on target to produce just over 1,000 barrels in 2015. When you look around the brewpub you find numerous awards illustrating the history of Walking Man Brewing. With a resurgence of energy and a focus on crafting quality brews from many of the original award-winning recipes, Walking Man continues to create a legacy of craft beer in the Columbia River Gorge. The anniversary event is free for all ages. Barbeque will be available from Pork, Wind & Fire and local musicians will provide a line up of live music throughout the evening. Complimentary cupcakes will be available while supplies last. A photo booth with fun props will be set up to capture memories with friends and provide a souvenir photo for guests to take home. “We’ve always celebrated the entire week of Thanksgiving, but this year we wanted to do something special on day one, to thank our community and friends for supporting Walking Man all these years,” said founder and brewmaster Bob Craig. remains a destination for beer enthusiasts from near and far. 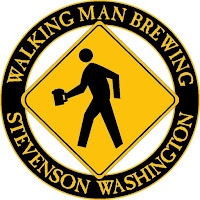 happenings, please visit www.walkingmanbeer.com or call (509) 427-5520. Always in Celebration . . .